Do you feel welcomed at your job? Other than when Beth in Accounting says hey? 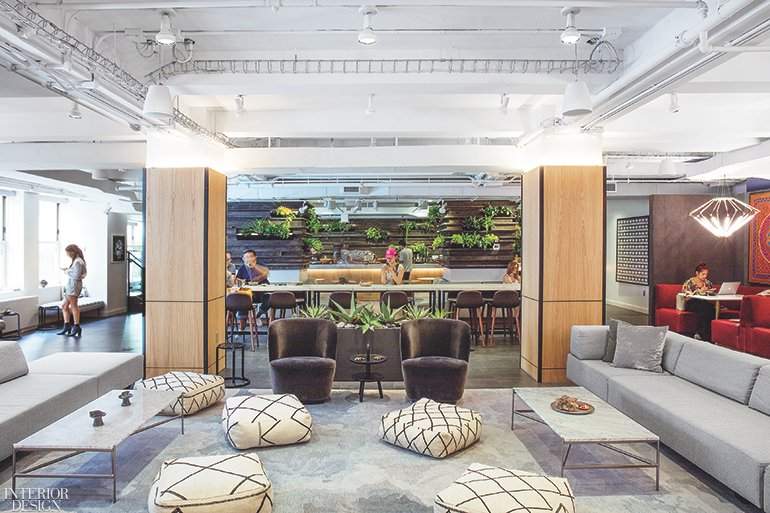 “Hospitality” is not something traditionally associated with work, but the idea of workplaces that truly invite people inside has been gaining steam. So leave it to the hotel specialists at Meyer Davis Studio, known for their luxe touch, to take that idea into completely new territory. 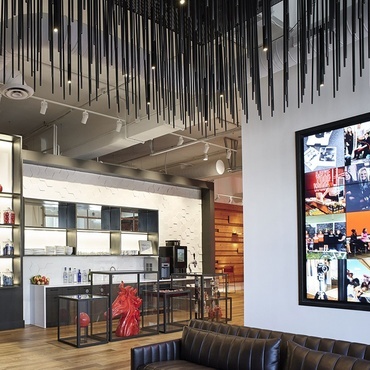 That’s precisely what they did at the first two Big Apple locations of a coworking concern called The Assemblage—one in NoMad and one in the financial district that includes, unusually, a boutique hotel. The projects both involved remaking existing buildings, a coordinated effort that took two years to complete. Executives at the Assemblage’s parent company, Prodigy Network, had an overall feel in mind, just not a lot of design specifics. “Individuals shouldn’t just sit in their own offices. It should be a hub where all these brilliant people start collaborating and act as a community,” Will Meyer says; he is co-principal of the firm with Gray Davis. “We pushed it past the hospitality trend and into the idea of wellness. Good energy blankets you when you’re there. 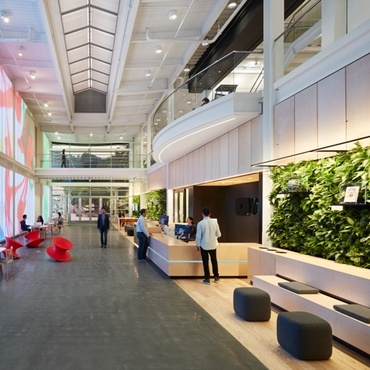 You can feel it.” The look is more farm-to-table restaurant than office. I’ll have a coddled free-range egg with my time sheet, please. The designs feature cozily upholstered furniture, meant to be rearranged at will, and arty installations sculpted from moss. Greenery is key. The fantastically inventive garden specialist Plant the Future inserted striking verdant compositions everywhere. “The Assemblage is about healthy living, something that makes people feel happier and is actually good for them,” Meyer continues. 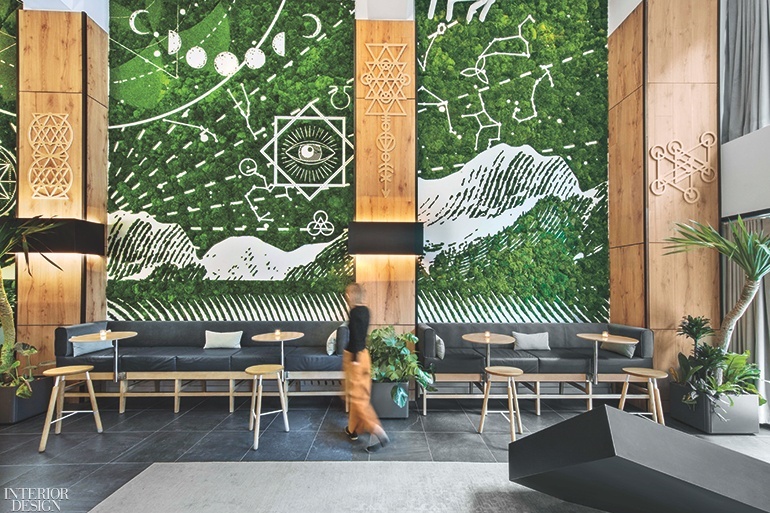 The NoMad location opens with a bang: the lobby’s Plant the Future moss-art wall resembling a mini-jungle carved out with a mystical group of hieroglyphics, complete with an all-seeing eye. 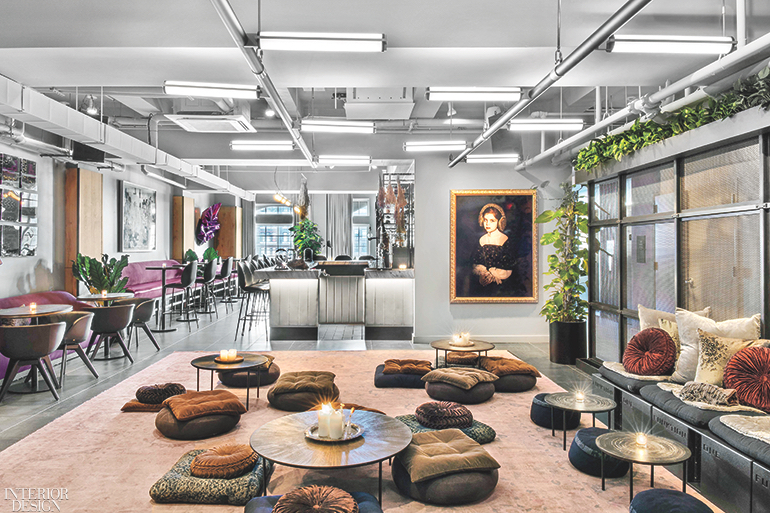 Of the 12 levels total, encompassing 48,000 square feet, the public has access to the ground level, two, and a mezzanine that was designed as an ersatz meditation enclave by The Assemblage’s in-house team. Up on 12, there’s an events space, where the marble-topped “elixir bar” faces a long sofa upholstered in turquoise and lounge chairs covered in a kicky fabric that looks like inkblots. 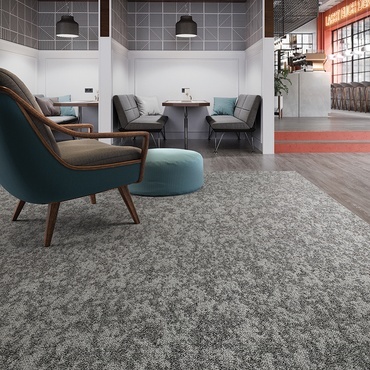 Coworking lounges and private offices boast Tom Dixon carpet in a pattern that swirls like smoke—Meyer says he chose it because, with his Assemblage clients, he simply could: “Who else except these guys would put that carpet in an office?” They furthermore sourced unique artwork from their extensive contacts. When you dig in, however, it’s clear that the design doesn’t just rely on bells and whistles. 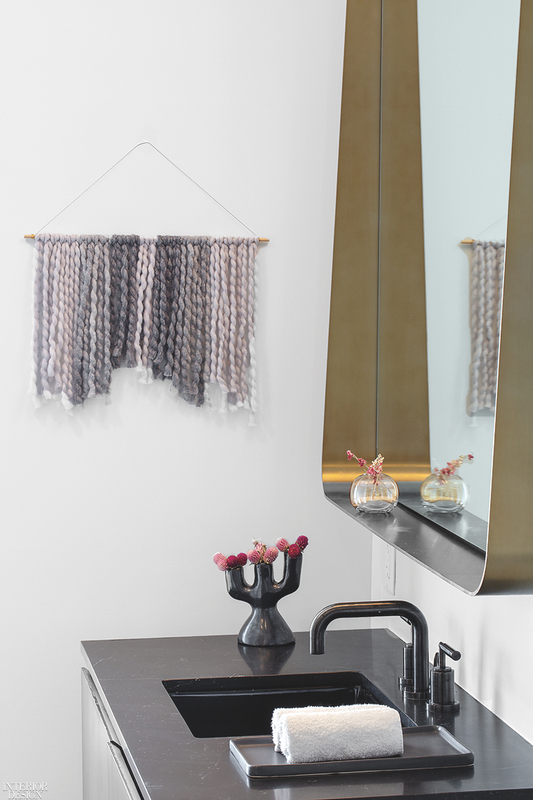 “We aimed to have a small palette of materials and simple details. It didn’t really need to have a ton of jazz on it,” Meyer explains. To soften the industrial aspect of the original space, he clad the ordinary concrete columns in the lobby with white oak, edged by blackened steel. 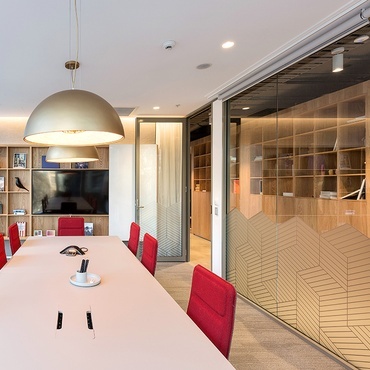 Between the columns hang angular chandeliers that are actually clusters of the same slim task lamps found on the office levels. Off the reception area, he turned to the oldest trick in the book, a cool paint job: Consider the sultry dark mauve applied to a fluted wall. 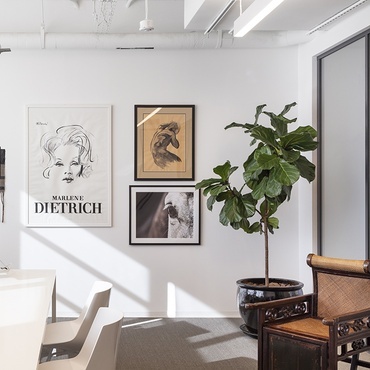 Offices are only part of the draw at the financial district location, where the complex mandate spanned coworking space and hotel. The first, second, and third levels are public, topped by three coworking levels and finally nine levels of guest rooms with full kitchens. “It could be a long stay for a jet-setter entrepreneur,” he says of the ideal user. 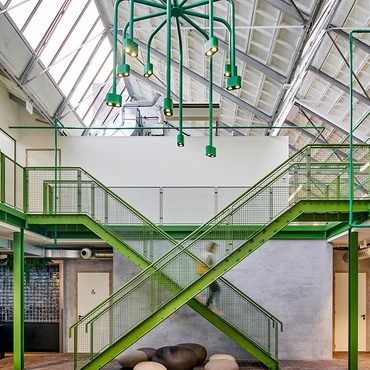 “But it could also be for tourists.” Since there’s no traditional hotel lobby, the moss installation descending from the entry’s barrel-vaulted ceiling helps draw people in. The big challenge was that each of the 79 guest rooms was different, since the building wasn’t designed for hospitality. In other words, no coming up with a template and then hitting Play. Everything was customized, which works because Meyer created a flexible, fluent language to be applied throughout the eight levels. The gray-stained oak, brass, and blackened-steel notes succeed on all the differing sizes and orientations of beds, desks, chairs, and sink vanities. Fabric-wise, he continued with the suiting fabrics. That versatility will come in handy as the Assemblage expands. “One of the goals for these two projects was to establish a design language that could be applied to future properties,” Meyer says. And why not? The results sure don’t feel like work. 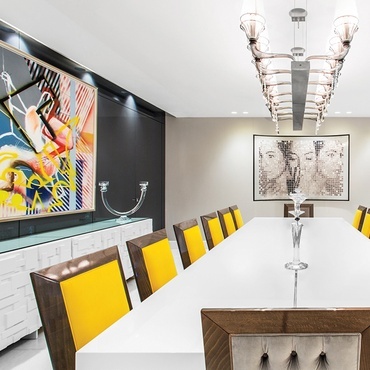 Project Team: Gray Davis; Elizabeth Curry; Amanda Tomlinson; Rebecca Hernandez: Meyer Davis Studio. Mancini Duffy: Architect of Record. MDLX: Layer Styling. Reveal Design Group: Lighting Consultant. Cider Press Woodworks: Woodwork. 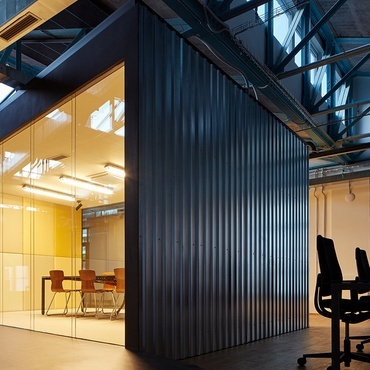 Collaborative Construc­tion Management: General Contractor. Originally published in the September 2018 issue.